Don't Worry, Hate Groups: Fox News Has Not "Gone Gay"
A handful of fringe anti-gay activists are having a meltdown over a "report" that alleges Fox News harbors a "growing pro-homosexual bias," ignoring the network's ongoing track record of smearing and stoking fears about LGBT people and LGBT equality. 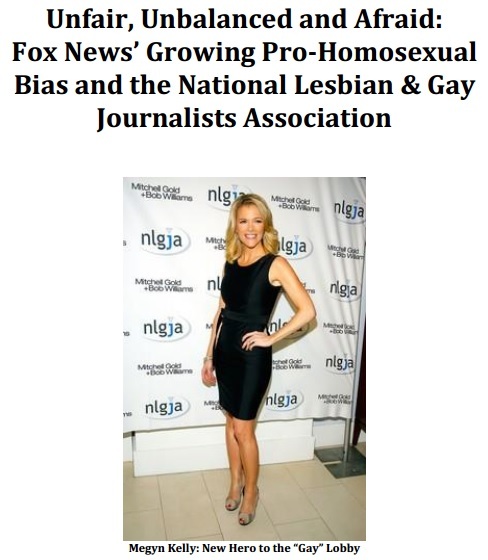 On August 14, the xenophobic, Islamophobic, and homophobic right-wing group America's Survival published a "report" documenting Fox News' alleged "growing pro-homosexual bias," citing the network's ties to the National Lesbian and Gay Journalists Association (NLGJA) and occasionally favorable coverage of marriage equality by personalities like hosts Megyn Kelly and Shepard Smith. America's Survival's president and noted homophobic conspiracy theorist, Accuracy in Media's Cliff Kincaid, is scheduled to present the report's "findings" during an event titled, "Crisis in Journalism - The Conservative Response," at the National Press Club in Washington, D.C., on August 20. Attacking a California law that would protect transgender students as "anarchy and madness"
Referring to a transgender woman as a "burly man wearing a dress"
And the list goes on and on (and on [and on]). Fox News' anti-LGBT bias is also evident in the stories the network chooses not to cover, like Russia's violent crackdown on the LGBT community, the brutal murder of a gay man in New York City, and the historic passage of marriage equality in Rhode Island, Delaware, and Minnesota. Kelly has a mixed record when it comes to covering LGBT issues. Though she's spoken up in defense of Chaz Bono, she's also helped peddle misinformation about medical care for transgender people and mocked the appearance of a transgender inmate. She's made comments suggesting her support for marriage equality, but gone on to whitewash the anti-gay extremism of one of the most vile anti-gay hate mongers in the country. Occasional pro-equality comments from Fox News personalities have generated headlines over the past few years, but the network's coverage of LGBT issues continues to be overwhelmingly driven by fear mongering, misinformation, and blatant animus, especially when it comes to transgender issues. 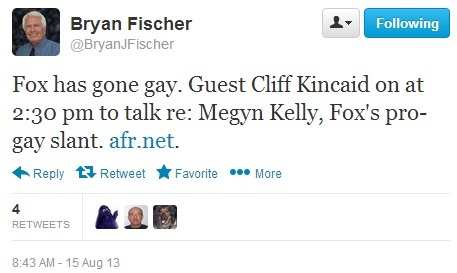 It takes a special breed of homophobic zealot to interpret Fox's "bias" as being anything other than staunchly anti-LGBT. Unfortunately, LaBarbera and Kincaid happen to fall into that category.